If you want to set up your own WordPress site, first you’ll need the perfect hosting company. A website host is the place where your files are stored. WordPress is made up of files and a database, which both reside on a server managed by your host. If a WordPress website were like a house, the hosting company would be like the plot of land where the house is built. Picking the right host is important for several reasons. If your host isn’t reliable, your website may experience downtime where it is inaccessible to visitors. If your hosting plan doesn’t have enough storage space or processing power, you may overload the server and crash your website. Your host plays a critical part in how fast your website will load, and also in the security of your website. In this post I’ll give you 3 recommendations for excellent hosting companies for photography websites. Before I do that, I want to give you a word of warning, and a disclaimer. Warning: be careful taking advice about hosting companies from other photographers or by asking online in photography groups. I can’t tell you how often I see posts where dozens of photographers are recommending terrible hosting companies. Perhaps those photographers have never had a bad experience, or maybe they just don’t know what to look for. You’ll also find blog posts that recommend hosting companies like Bluehost, even though Bluehost is a pretty terrible hosting company these days. You’ll usually see this because those bloggers are getting paid a commission everytime someone signs up, and Bluehost pays a very high affiliate commission. That leads me to my disclaimer. I am making my recommendations in this post based on my experience working with almost every major hosting provider. I do site migrations, setup, configuration and optimization on a regular basis for clients. I’ve also personally used all of the companies that I recommend in this post. I do use affiliate links in this post, but my recommendations are not influenced at all by the affiliate commissions. However, purchasing your hosting after clicking a link in this post will help support Fuel Your Photos at no extra cost to you! If you ever have questions about why I recommend or don’t recommend a company, you can leave a comment on this post or ask in the Fuel Your Photos Facebook group. This post isn’t an exhaustive list of every good hosting company, but I wanted to keep the options simple to make it easy for you to choose the right host for you. How many separate websites do you need to host? Do you plan on hosting your client proofing on your own website? What is your budget for hosting your website? Would you rather have more technical control, or have more of the technical details handled for you? Are you going to need eCommerce functionality (selling products or services directly from your site)? Do you want email hosting included with your web hosting? Where are you located in the world, and will having a server closer to your physical location make a difference? Fast and reliable service. At least 99.9% uptime. A knowledgable and easy to access support staff. The ability to automatically backup your website and easily restore to a previous point. Free/included and easy to install SSL certificate. HTTP2 enabled when using HTTPS. Free or affordable migration services when moving your WordPress site to their hosting. Free trial or money back guarantee. All three of my recommendations check all of these boxes! So which option is right for you? Lets look a little closer at Siteground, Imagely, and Cloudways and see which one would be the best fit for your photography website. Siteground is my recommendation if you are looking for traditional shared hosting. They have affordable plans (starting at $3.95/mo at the time of this writing) that are perfect for small websites. If you only have one website, you use a 3rd party proofing solution (like ShootProof for example), you don’t need eCommerce, you get less than 10,000 visits per month and have less than 10GB of website files, you could get by with the StartUp package and still have fast and reliable hosting. The GrowBig and GoGeek plans offer the ability to expand your storage and traffic, as well as adding some other features. One thing to keep in mind with Siteground is that the promotional price is good for your first “term” which can be 12, 24, or 36 months. In other words, if you pay up front for 36 months, you’ll lock in that promotional price for that entire time. After that, you’ll pay the “regular price” (which is clearly listed on the package details page). I thought this was worth mentioning because when I first signed up, I only signed up for 12 months and I was kicking myself for not going ahead with 36 months when the price jumped (I didn’t realize you could lock in the promo for 36 months). Siteground uses cPanel as the control panel, so if you’ve used shared hosting before you’ll probably be familiar with the interface. There is an easy WordPress installer, and it is also easy to set up your site with SSL from the beginning. There is an extensive knowledgebase to cover the most common support topics, and support is available 24/7 via phone, live chat and a ticket system. I’ve used the support many times (I normally use the live chat) and almost always get exactly what I need in a matter of minutes. I’ve had 1 case where the support representative couldn’t help me (they didn’t understand my question), then I tried live chat again a few hours later and got the answer I needed from a different support rep. You should realize that Siteground is a huge hosting company that doesn’t specialize in photography websites. That doesn’t mean you won’t get good support or that your website won’t work well on Siteground’s servers, but you won’t necessarily get someone who is knowledgable about the specific needs of photographers. Siteground is also the only host on my list that offers email hosting as part of your hosting plan. Personally, I recommend keeping your email hosting separate from your website host anyway (it certainly makes moving much easier if the need ever arises), but if you’re trying to save some money, this could be helpful for you (email hosting from Google or Rackspace is typically $5-10/mo). I still use the Siteground email hosting on one of my domains and I’ve never had any issues with deliverability. Not a bad option if you aren’t going to be moving hosts and you will be using an email client to send/receive email. I’ve been using Siteground for several years now, and my main photography website is still hosted on Siteground. I’ve been extremely happy with their service and product and highly recommend them if what they offer fits your needs. You know how earlier I said there isn’t a host that is perfect in every situation? Well, if I had to pick just ONE host that is most likely to be the right choice for photographers, that host would be Imagely. There are so many benefits to using Imagely as your website host that it will be hard to mention them all here, but I’ll try to hit the high points. First of all, Imagely has a long track record of working with WordPress and with photographers. They are the company behind the NextGEN gallery, as well as the Photocrati Theme, both of which have been popular with photographers for years. They also host The WordPress Photography Podcast and the WordPress for Photographers Facebook group, which both actively seek to help photographers get the most out of their WordPress websites. The Imagely staff includes professional photographers, and you’ll find them attending and speaking at photography conventions frequently. This is a big deal because when you ask questions about your website, Imagely support is going to be able to answer in a way that addresses the specific needs of photographers. Imagely support uses a ticket system, but each time I’ve used them I’ve gotten a response in less than 15 minutes. Another huge benefit to using Imagely for hosting is that you get more than just hosting. You also get NextGEN Pro (plus other plugins) , Genesis (pre-installed), and all of the Imagely Genesis child themes. This is more than $250 in additional value that comes included in the price of hosting. This also gives you everything you need for a turnkey website solution, right out of the gates. Genesis is one of the best themes ever made for WordPress (especially for SEO and performance), and NextGEN is one of the most popular gallery plugins ever. It also allows you to do your own proofing (+print & digital download sales), and Imagely provides servers that can handle the strain that proofing often causes. You can also upgrade your storage space all the way up to 1TB if needed! When you sign up for Imagely, WordPress, Genesis, NextGEN and all of the Imagely themes are already installed for you and accessible via a development URL. You can literally just add your content, adjust your domain nameservers, and have a website up in minutes. If you don’t want to use their themes or plugins, that is fine too! You can easily install your own theme just like you would on any other hosting company. 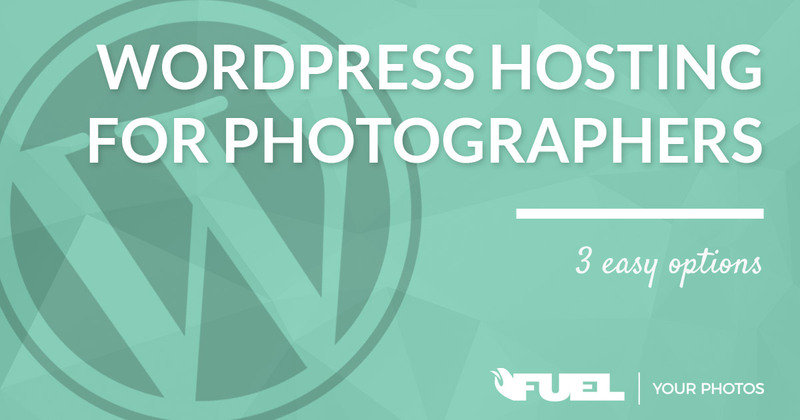 Imagely is really the perfect hosting solution for photographers who want to use WordPress. There are really only two situations when I could see Imagely not being the perfect fit. First is if you are on a really tight budget. Imagely’s packages start at about $25/mo at the time of this writing. For what you get, this price is very competitive. Keep in mind this isn’t the typical shared hosting that you’ll find for less than $10/mo in other places. This is fully managed and supported cloud hosting, which is going to be much faster, more scalable, and more reliable than most shared hosting. Still, the price could be out of reach for some, especially if you also need email hosting. Second, this might not be perfect for you if you need lots of control over your server. Don’t get me wrong, You can still do most of the things typically needed, but because the hosting is managed, there are certain things you won’t be able to do. For example, some plugins may be restricted (usually for your own good), and you won’t be able to edit the database directly. If you aren’t a developer, these restrictions are probably a good thing… but if you are an advanced WordPress user and need a little more flexibility, that is where my third recommendation comes in. Cloudways is where I currently host Fuel Your Photos, and many of my other sites. I started using them last year and fell in love pretty quickly. Cloudways is basically a developer friendly managed layer on top of cloud hosting (I currently use the Digital Ocean option, but you can also use Amazon, Google, and other options). Basically, if you need advanced functionality and flexibility, but aren’t an experienced server admin, this is a good option for you. For the basic user, it is extremely easy to sign up and get WordPress installed. In fact, it is even easier than on Siteground (not as easy as Imagely since that is automatically done for you). You could have a WordPress site up and running within a few minutes. There is technically no limit to how many sites you can set up on one plan, but you are restricted by resource usage. With Cloudways you don’t get cPanel, but you get an even more intuitive control panel that allows you to do many of the same things. You can manage which services are running on your server, edit your PHP version, enable LetsEncrypt, access your database, and more. One of my favorite parts is that you can easily setup and clone “applications” (basically a WordPress installation in the context of this article) which makes it easy to set up development sites or test changes on your site. You also get support via live chat and a ticket system, on top of an extensive documentation. I’ve used their live chat for VERY advanced questions and gotten help within minutes. The support staff is noticeably more knowledgable than typical shared hosting support staff. However, in most cases I don’t even need to contact support because their controls are so intuitive and the documentation is excellent. I currently use a plan that is $17/mo plus 50 cents for offsite backups. The plans are easily scalable to fit the needs of growing websites. If you’re looking to get away from shared hosting and have a solid understanding of hosting + WordPress, I can’t recommend Cloudways enough. What if I just renewed my hosting with ___ (Bluehost, Hostgator, Godaddy, etc)? This is one of the most common reasons I hear for photographers sticking with their terrible web hosting. I have two thoughts for you. First, many hosts will offer a prorated refund if you ask for it. So in that case, you have nothing to loose. Second, even if you just paid a couple hundred dollars to renew, it may STILL be worth switching to a better host if you are having problems that cause your site to be unreliable. Just think, if even one client who would have booked you can’t access your website, that is a loss of far more than the amount you just paid for renewal. What if I outgrow my plan or need to change hosts? This is a common problem and most hosting companies will be able to accommodate your growth. However, one of the big benefits of using WordPress in the first place is that it is easy to move your content to another host if that becomes necessary. I remember back when I first started building websites and I signed up for a very popular webhost at the time. After a few years, they really went downhill fast. I had to move to a better host quickly to make sure my site was readily available. It is especially easy to switch hosts if your domain and email are registered/hosted externally. Usually your new hosting company will even offer to move your site for free. Should I register my domain name with my hosting company? I highly recommend using a reputable domain registrar that is not your hosting company. My top two choices would be Namecheap and Google Domains. Godaddy is a distant third, but acceptable for domain registration only. If you have already registered your domain with your hosting company, it is fairly easy to transfer the registration to one of these options. Where should I host my email if I choose Imagely or Cloudways? Recently I started using Rackspace for email, and I’ve been impressed with how well it works. The interface to get it set up was pretty archaic, but the deliverability has been excellent, and the price is pretty good ($10/mo for up to 5 mailboxes). I also use G Suite (Google’s business solution, previously called Google Apps for Business) for email on another domain, and it is around $5 per month. I tried the email service at Namecheap and had deliverability issues. I’ve also been using Mailgun for delivering email from my site (via forms and registrations). It is hard to go wrong with any of the hosting companies I’ve recommended here, but make sure to do your own research before making your final decision. Check out the websites, look for reviews online, think carefully about your needs, and if needed, contact the hosting company directly with questions. Picking the right host for your website is a decision that can impact your business’s bottom line, so don’t take it lightly, but hopefully you can feel some comfort knowing that the recommendations here have been vetted and will be updated in the future if anything changes drastically. If you have general questions about my recommendations, or if you have had an amazing experience with a different hosting company you think I should know about, leave a comment below or head over to the Fuel Your Photos Facebook group to start a conversation!